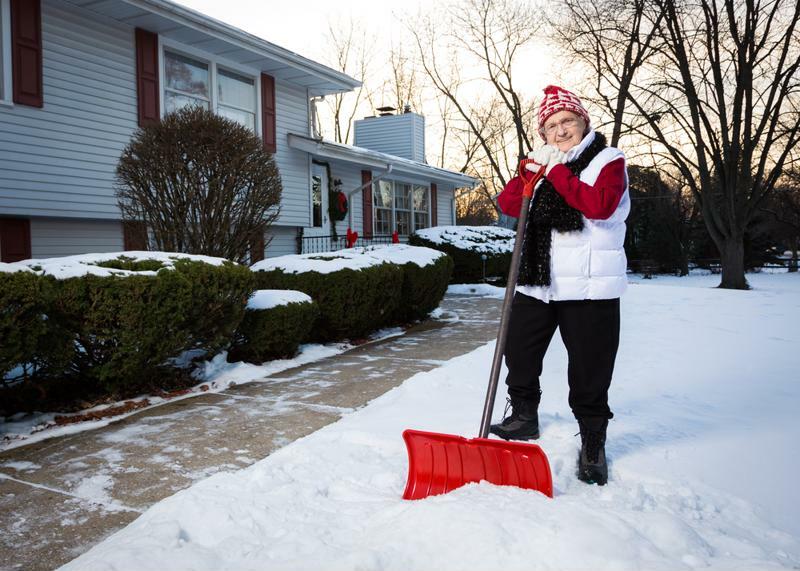 Seniors who live in climates that receive snow and ice during the winter are at an increased likelihood of falling. Those who live at home and do their own shoveling or yard work are especially likely to fall. However, even individuals who reside with caregivers and walk with supervision may be at risk. Make sure that areas around your home are shoveled and salted to prevent falls, and don't hesitate to ask for assistance with these tasks. If you'd like someone to walk with you to the car to provide an arm to lean on, that's OK. Consider using a walker to help you stay balanced while walking outdoors in the winter. Falling risks also go up indoors during the winter because melted snow on the floor can prove slippery. A senior who has been outside and become very cold may have reduced mobility and balance and can fall while moving indoors. Always check on seniors when the temperature dips or snow and ice are present. Just giving them a call can provide insight into how the person is doing and assistance in an emergency. Seniors should dress in layers and wear winter accessories to reduce the chances of getting hypothermia. Hypothermia occurs when the body becomes so cold it starts to shut down. The National Institutes of Health noted that hypothermia is a less obvious danger for vulnerable adults that requires immediate treatment. Individuals who are older are at an increased risk of hypothermia because their bodies cannot withstand the cold as long as younger people. It's also true that some medications and illnesses can further heighten this risk. Seniors naturally create less body heat, which means they are often colder than younger individuals to start with. Signs of hypothermia include slowed reactions and movements, sleepiness, slurred or slow speech and confusion. Wearing layered winter gear along with a hat, mittens and warm shoes can do wonders in preventing hypothermia. Also make sure your home temperature is set to 68 degrees Fahrenheit or higher. Seniors may want to talk to their physicians about any medications or chronic health problems that could increase their risk of hypothermia. According to the American Heart Association, seniors who have cardiovascular conditions may experience increased side effects in the cold. Because lower temperatures and winds can reduce body heat, blood vessels tend to constrict, making it more difficult for oxygen to reach the entire body. The AHA recommends that seniors wear layered clothing to trap heat and provide insulation. Seniors who are thin are especially at risk of cold-related cardiovascular issues because they do not have as much fat to provide warmth and keep blood flowing. Seniors often find their arthritis flares up in the cold weather. It's common for seniors to have chronic pain like arthritis. When it's cold outside, many people note their symptoms worsen. This can lead to taking excess pain medications, whether prescribed or over-the-counter. Talk with your doctor if you find your joints are more painful than usual. Physicians may recommend changing your medication or trying home remedies like Epsom salt baths to relieve the aches. During the winter, the amount of sunshine is typically far less than during the rest of the year. This can make anyone feel sluggish and want to sleep more. Getting extra rest isn't a problem until sleeping becomes a huge part of the day. Seniors may want to consider setting an alarm to wake up for breakfast and ensure they're not staying in bed late because of the winter darkness. Keeping a regular schedule can be a big help in avoiding sundowners syndrome, as can opening the blinds and turning on the lights during the daytime.